My previous posts focused on COPE (Create Once, Publish Everywhere) and content modularity, the fundamentals for ensuring that content can be managed and distributed to virtually any platform. But ensuring that your content can be delivered to those other platforms does not mean that it can display appropriately on them. Content often contains very important semantic markup, used to emphasize the content, relate it to other content, describe it, etc. By markup, I mean HTML, character encodings and microformats, among others. Although this markup is important to the content, it also makes it “dirty”, potentially compromising its ability to live and flourish in the myriad places to which it will get distributed. 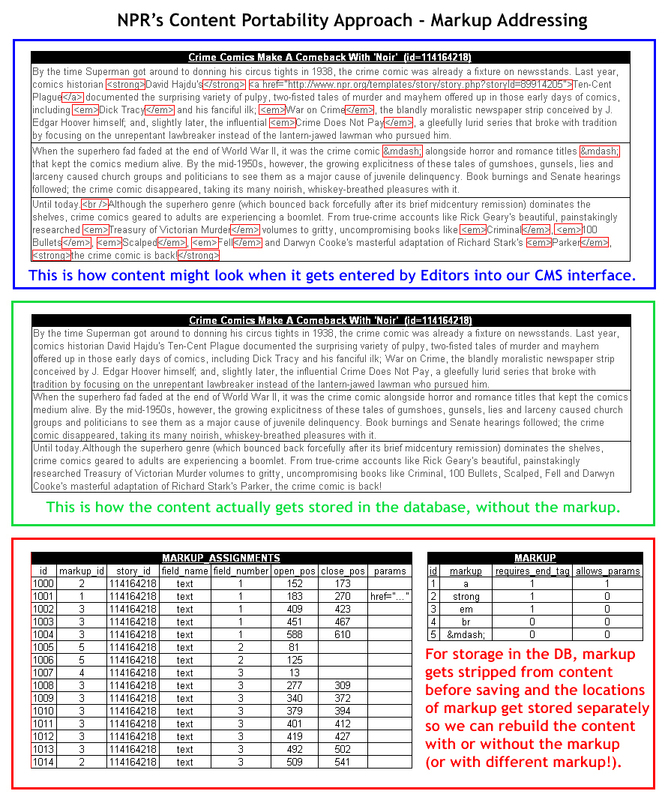 No matter how modular the content is in the database, if it is sullied by this markup, it is not truly portable. As a result, just building an API is not enough. The API needs to be able to distribute the content to any platform in a way that each platform can handle. To demonstrate this problem around portability, I often use the pre-iPhone iPod as an example. This device did not parse HTML. Rather, tags would simply be printed as strings. 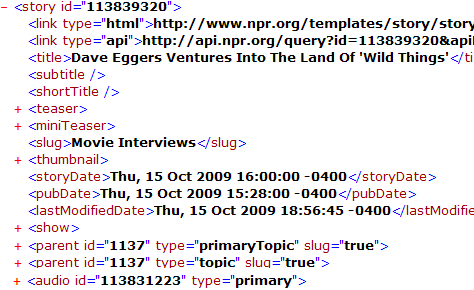 When podcasting took off, some NPR titles had HTML tags in them, including < em > and < strong >. Because iPods were not able to render the HTML, titles would like something like, “This is a < em >great< /em > title!” Similar, another fail scenario that is relevant to NPR is an HD Radio display. These devices are also not able to render markup printing these tags to the screen. There are two primary ways of handling this problem. The more common way is to store the dirty content in the database and to maintain a series of scripts that handle it on the way out. Although this is potentially effective for specific goals, there are some significant problems with it. 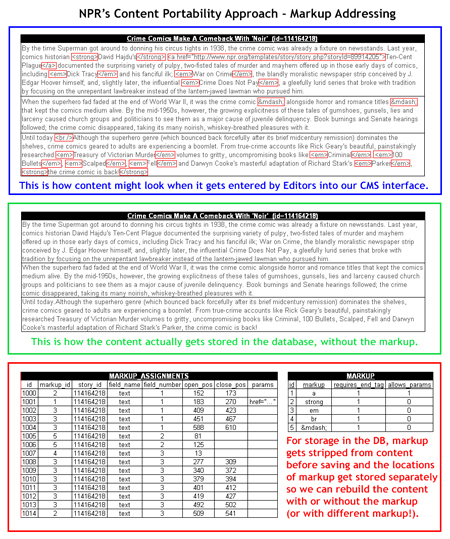 For starters, stripping out the markup as it gets distributed means that the markup still lives with the content in the database. As a result, as new platforms arise and as markup standards evolve, the markup in the content will remain static. So, each distribution script that handles the markup will need to be carefully maintained and updated accordingly. Moreover, since each distribution platform could have its own compliance with the various forms of markup, each of these outputs may require their own script to handle the content (that is, the more distribution channels there are, the more scripts there are to maintain). Finally, the majority of systems that allow markup in this way do very little to limit the type of markup that is used. Because of the tremendous variance in how the markup is used in the content, these scripts will need to be increasingly complex, causing the accuracy to be tougher to guarantee. A range of fields in the system are markup-enabled, allowing Editors and scripts to include HTML and other markup values in the content directly. For each field that allows markup, very specific values are allowed. Some fields allow more, some less, but all fields are limited to nothing more than the 25 tags and character encodings that the system as a whole allows. We apply client-side handling to ensure that no markup beyond those allowed by the field are used for that field. We also enforce proper nesting and syntax for the markup. Before saving the clean and acceptable markup to the database, we identify all markup for each field and begin our “addressing”, which is essentially identifying the character numbers of the markup in the text. For each tag or character identified, we find the character position for where it starts. If applicable, we also find the character position for the close tag. We then strip out the markup from the text and store in a relational table the address in the text that the markup was found. This relational table does not include the markup itself. Rather, that is stored in a separate table that is the authority for which tags are allowable. The image below represents roughly how we store this kind of information. Distributing the content without any markup is as simple as pushing out the content from the database directly, without any further processing. This is helpful for platforms that are unable to render markup, including those mentioned in my examples above. Distributing the content with the original markup is just as easy by reassembling the markup based on the addresses. It is easy to only distribute only some of the markup based on what the markup is. An example of this is if the destination product wants to emphasize content but does not want to allow for links to other content. As markup, such as HTML tags, get deprecated, this approach only requires a change to one field in the entire database, instead of having to cycle through the database to find all instances of the old tag to replace it with the new one. For example, < b > has been replaced with < strong >, so we simply need to modify the one record in the authority table for tags to make this change apply across the entire set of content. As new platforms arise, if they require specialized markup, it is easy to transform the existing markup to anything else required for these new platforms. Adding new allowable tags is easy by simply extending the client-side handling and the authority table. These tags can include microformats and other business-critical tags that help describe the content. For example, NPR could very easily create a tag for our internal purposes for < station >, such that for every station that gets tagged, rather than rendering this tag, the system will look up the station in our database and replace that < station > tag with a hyperlink to the station’s home page. NPR’s system applies these methods to specific fields throughout our CMS. When distributing the content through the API, however, we only currently apply the power of Markup Addressing to the story full text. The API has a field for < text > which removes all markup for the syndication as well as < textWithHtml > which reassembles the content with all markup. Extending this to all other markup-enabled fields would be quite easy under this system, although there has not yet been a need to do so. Regardless of which approach is taken, there is one other significant issue that prevents true portability of content… the content itself! This image is part of an NPR story that demonstrates appropriate use of HTML within the body of the text. The artists’ names are linking to artist pages, but the meaning of the story is completely unaltered by the removal of the markup. 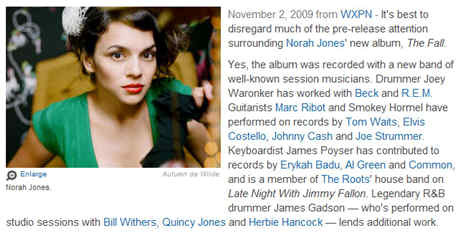 In this scenario, removing the links to the artists’ names in the text, for example, does not alter the meaning of the content. Of course, it does diminish some of its power as the user cannot easily learn more about these artists within the context of this story. That said, distribution of this content without those links will not adversely affect the meaning of the story. The artist names are valid and appropriate within the body of the text. This image is part of the same NPR story demonstrating the use of calls-to-action, which make the content unable to provide meaning without the context of the markup. These calls-to-action make the content less portable, specifically to platforms that are not markup enabled. Notice that within this content there is a link to related content where the link text is “Listen to The Entire Album”. Abstracting away the link itself actually alters the meaning of the text as the text provides no information about the audio asset. There is no indication as to what album or who the artist is. So, as this content gets distributed to platforms (both known and unknown), pulling out the markup actually adversely affects the content. This is a problem for every content producer, including NPR. Although we have gone through great measures to put the content in the best position to live and thrive in all platforms, there is still work to be done to ensure the success of our distribution strategies. Some of these efforts are technical in nature. Others could impact editorial processes and style guides. But in all cases, our goals are the same… to be a media organization that produces great content for our users, wherever they wish to consume it. 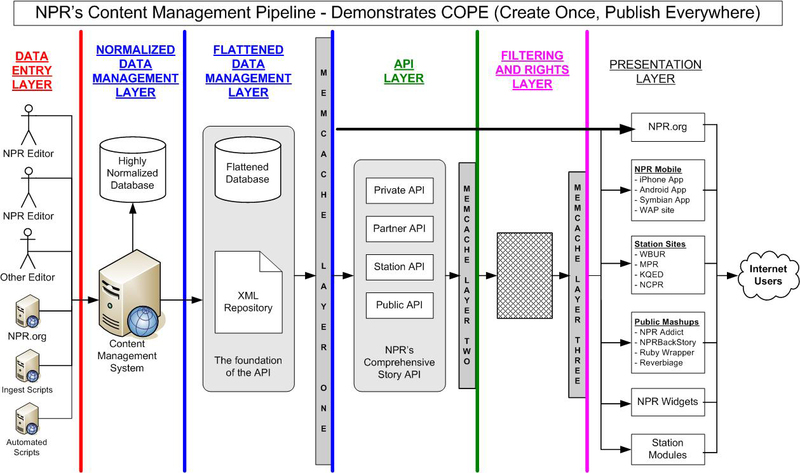 As discussed in my previous post, COPE (Create Once, Publish Everywhere) is a fundamental philosophy that drives NPR’s digital publishing and distribution strategy and is the foundation of the NPR API. Supporting it all is a single system that manages all incoming content and funnels it out through a single distribution pipe, regardless of content type or destination. A key principle that supports COPE is ensuring that content is stored in a modular way. Modular storage of content is more than just database normalization. It requires strategic design of the data model to ensure that discreet objects are stored in distinct locations. To create the right design, you must truly understand your system and the assets that it stores. That is, you need to be able to identify and represent the object (or series of objects) that is at the core of your system. For NPR, the core of the system is a story. We then attach “resources” to the story, each of which is its own object in the database (examples of resources include full text with each paragraph stored as distinct records, audio, video, images, related links, and a range of other object types). Then stories get attached to lists, which are essentially a series of taxonomies that help our systems slice through the stories. 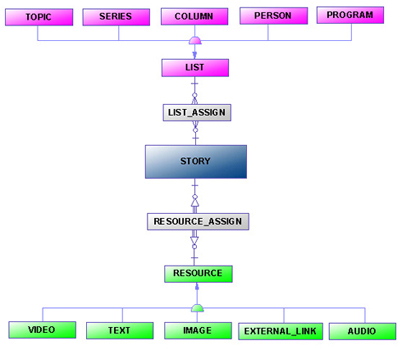 The diagram above is a basic entity diagram of how NPR manages data for a story, some related resources and the list to which the stories are assigned. This is a conceptual model that represents how these entities relate to each other and does not include all resource or list entities in the system. The physical model, obviously, is much more complex. Click here for a larger and more complete view of this diagram (PDF). NPR’s system is obviously much more complicated than this, but the breakdown of story/resources/lists is the foundation of it all. Accordingly, storage of this information in the database needs to ensure that all of these objects can be manipulated independently. With this approach, NPR is able to create a list of all images in the system, or all stories that have video, or all stories in the News topic, or any number of other combinations of stories or resources. The power of this modularity is that we have tremendous control over what gets distributed to each destination. And the distribution of content for all of these scenarios is the same simple REST-based API, requiring no special coding to generate the content for the different destinations. 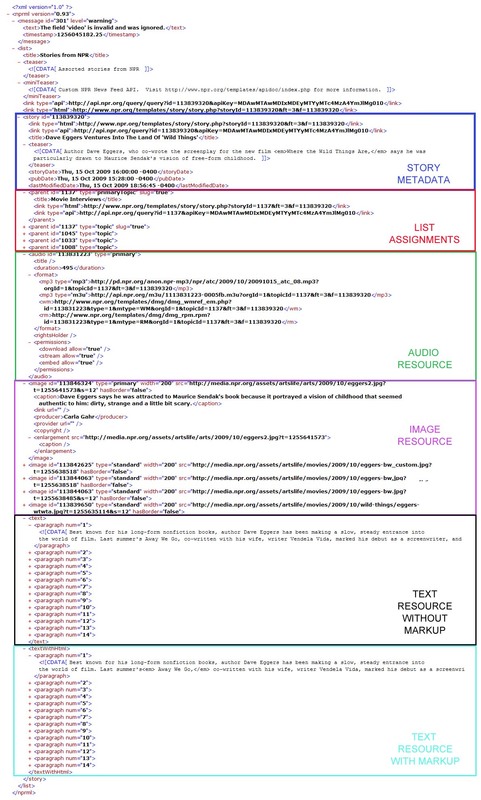 The above is an excerpt of XML outputted from the NPR API. Clean, effective storage of the content makes it a simpler and more flexible process to manage it differently as it gets distributed to different destinations. Click here to see an expanded view of the XML with annotation detailing how it maps to the entity diagram. Conversely, WPT’s tend to store objects to enable the building of a web page. As a result, the content may be bundled together in database fields, storing the actual references to images, video and audio entirely within the story content text. It is still possible that the WPT’s are adhering to some form of data normalization in their storage techniques, but that does not mean that these systems are embracing COPE. There are two significant problems with the WPT approach of data storage. First, as an example, the image references within the block of text will contain HTML and possibly other markup, making the text block dirty. Any distribution to other platforms could then require special treatment to prepare the content for that destination. More importantly, however, is the fact that these same images are very difficult to repurpose because they are embedded in text. So, it would be quite a challenge to make a feed of images, to identify only those posts that contain images, to resize some or all images in the system, or to consistently restrict distribution of images that do not have the rights cleared. Building systems that manage the content in a modular way and separates it from display sets it up well to be distributed on a range of platforms. The final piece to the puzzle, however, is content portability. Content portability ensures that the content can actually live and thrive in all platforms to which it gets distributed (even those that do not yet exist). Building a distribution channel, like an API, is simply not enough anymore. Content portability must be applied at the CMS level, which will be the topic of my next article. This post first appeared on ProgrammableWeb.com. The digital media world is in the process of dramatic change. For years, the Internet has been about web sites and browser-based experiences, and the systems that drove those sites generally matched those experiences. But now, the portable world is upon us and it is formidable. With the growing need and ability to be portable comes tremendous opportunity for content providers. But it also requires substantial changes to their thinking and their systems. It requires distribution platforms, API’s and other ways to get the content to where it needs to be. But having an API is not enough. In order for content providers to take full advantage of these new platforms, they will need to, first and foremost, embrace one simple philosophy: COPE (Create Once, Publish Everywhere). 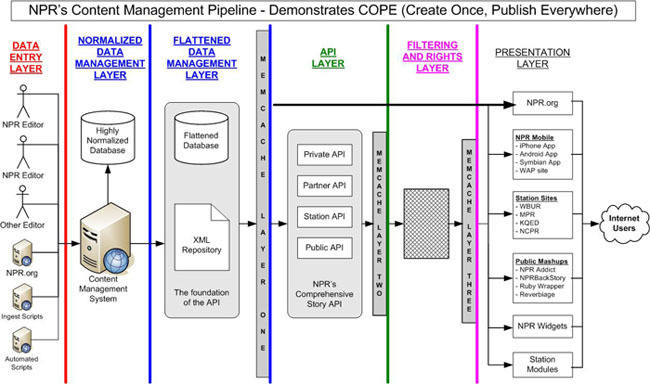 The diagram above represents NPR’s content management pipeline and how it embraces these COPE principles. The basic principle is to have content producers and ingestion scripts funnel content into a single system (or series of closely tied systems). Once there, the distribution of all content can be handled identically, regardless of content type or its destinations (Click here for an enlargement of this diagram). Through COPE, our systems have enabled incredible growth despite having a small staff and limited resources. Although the CMS is home-grown, COPE itself is agnostic as to the build or buy/integrate decision. Any system that adheres to these principles, whether it is a COTS product, home-grown, or anything in between, will see the benefits of content modularity and portability. In this series of posts, I will be discussing these philosophies, as well as how NPR applied them and how we were able to do so much with so little (including our NPR API). These philosophies have a direct impact on API and distribution strategies as well. Creating an API on top of a COPE-less system will distribute the content, but there is still no guarantee that the content can actually live on any platform. COPE is dependent on these other philosophies to ensure that the content is truly portable. COPE is the key difference between content management systems and web publishing tools, although these terms are often used interchangeably in our industry. The goal of any CMS should be to gather enough information to present the content on any platform, in any presentation, at any time. WPT’s capture content with the primary purpose of publishing web pages. As a result, they tend to manage the content in ways focused on delivering it to the web. Plug-ins are often available for distribution to other platforms, but applying tools on top of the native functions to manipulate the content for alternate destinations makes the system inherently unscalable. That is, for each new platform, WPT’s will need a new plug-in to tailor the presentation markup to that platform. CMS’s, on the other hand, store the content cleanly, enabling the presentation layers to worry about how to display the content not on how to transform the markup embedded within it. True CMS’s are really just content capturing tools that are completely agnostic as to how or where the content will be viewed, whether it is a web page, mobile app, TV or radio display, etc. Additionally, platforms that don’t yet exist are able to be served by a true CMS in ways that WPT’s may not be able to (even with plug-ins). By applying COPE, NPR was able to quickly jump on advancements throughout the years like RSS, Podcasts, API’s and mobile platforms with relative ease. As an example, the public API took only about two developer months to create, and most of that time was spent on user and rights management. View more presentations from danieljacobson. This presentation shows the same NPR story displayed in a wide range of platforms. The content, through the principles of COPE, is pushed out to all of these destinations through the NPR API. Each destination, meanwhile, uses the appropriate content for that presentation layer. Separating content from display is one of the key concepts supporting COPE. In the most basic form, this means that the presentation layer needs to be a series of templates that know how to pull in the content from the repository. This enables the presentation layer to care about how the content will look while the content can be display-agnostic, allowing it to appear on a web site, a mobile device, etc. At a high level, many systems and organizations are applying the basics of COPE. They are able to distribute content to different platforms, separate content from display, etc. But to take some of these systems to the next level, enabling them to scale and adapt to our changing landscape, they will need to focus more on content modularity and portability. In my next post, I will go into more detail about NPR’s approach to content modularity and why our approach is more than just data normalization. Last night, I had the pleasure of joining my old colleagues from NPR at the Online Journalism Association’s award ceremony in DC. First of all, it was great to see the gang again after three weeks as a non-NPR employee. It was also great to see NPR nominated for a wide range of awards (eight in total). The highlights for me, however, were that the NPR API won its first award (explicitly) and the fact that Kinsey Wilson won the Rich Jaroslovsky award (congratulations, Kinsey!). The NPR API won the Gannett Foundation Award for Technical Innovation in the Service of Digital Journalism, which is a huge honor! I couldn’t be more proud of the NPR team, and more specifically the NPR Digital Media Tech Team, in claiming this. The work that the team did is amazing and it is great to see that work getting recognized in such a prestigious fashion. I am also very thankful that Kinsey invited me to accept the award on behalf of NPR. Representing such a tremendous team in this forum is a huge honor for me. While accepting the award, I explicitly thanked Zach Brand and Harold Neal as my “partners in crime” in getting the API live. While I stand by that statement, I do wish I explicitly thanked the rest of the Tech Team who has played a very important role in the evolution of the API since its launch in 2008. Congratulations to Demian Perry, Jeremy Pennycook, Jennifer Oh and the other contributors to NPR Mobile as well, for winning the award for Outstanding Use of Emerging Technologies.